(CNN) - Republican Sen. Marco Rubio of Florida will headline a birthday fundraiser for Iowa Gov. Terry Branstad next week, a spokesman for the governor announced Thursday. 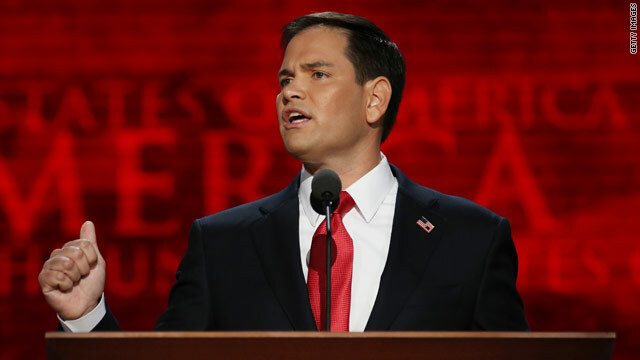 The speaking gig will no doubt stir talk of a potential 2016 presidential bid for Rubio, as the event provides the first-term senator the chance to mingle with the Republican class in Iowa, the first state to hold caucuses in a presidential election. At last year's fundraiser, six of the Republican presidential hopefuls had a speaking slot, with the exception of Mitt Romney. Newt Gingrich showed up late to the event, and did not give remarks. A rising star in the Republican Party, Rubio was vetted for the GOP vice presidential spot and served as a top surrogate for Mitt Romney, particularly among the Latino voting bloc. Wow! Do the Republicans really think the Hispanic community is that stupid? Trotting out an Hispanic face to try to get the Hispanic community to forget the 50 years of ignoring the Hispanic community by Republicans is insulting. It's easy to see through this "wolf in sheep's clothing" tactic. This is purely driven by calculation.....instead of conviction and commitment.